S-Class Abilities are Special Abilities which have effects similar to Potentials. 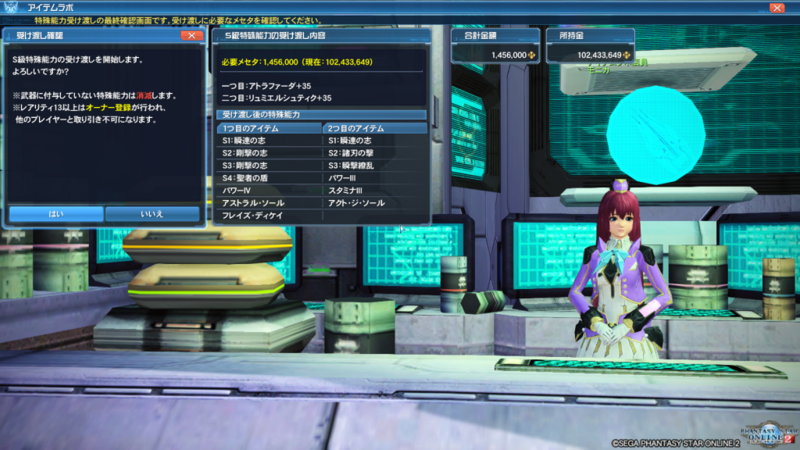 S-Class Abilities can be found as Special Ability Factors on certain ★13 or higher weapons. These abilities can also be found on weapons that drop. Weapons that support S-Class abilities have a purple border around the icon. S-Class Abilities are classified into different types [S1] [S2] [S3] [S4] etc. It is not possible to put two or more of the same S-type ability onto a single weapon. For example, you can not put two [S1] types on the same weapon. In addition, the weapon itself needs to have a slot that supports the [S#] type. For example, if a weapon does not support [S1] types, then you can not attach an [S1] ability. To affix an S-Class Ability, the ability must either be on the weapon or unlocked from a Special Ability Factor. S-Class Abilities will be affixed at 100% and will not be penalized when upslotting your weapon as you can see in the image above. This means you can move any of Atlas’s S4 SAFs to any of the Atlas Weapons through Zieg’s Conversion. Acquire Atlas Farder through upgrading or converting at Zieg. 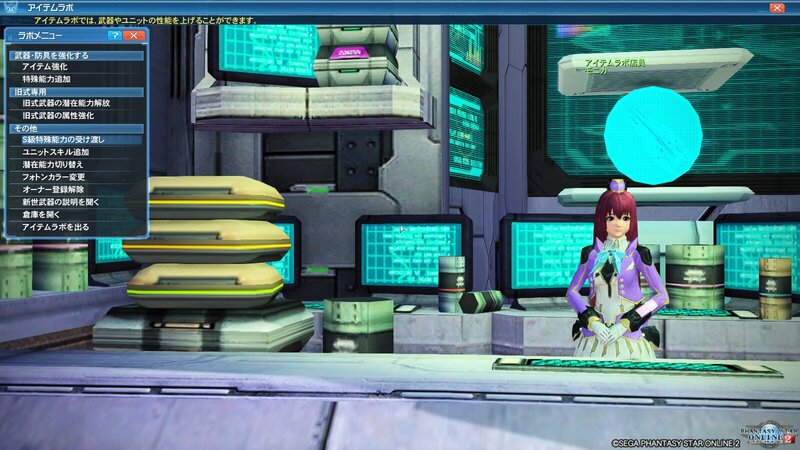 Affix the SAF of Atlas Farder onto the weapon at the Item Lab. Convert Atlas Farder to Atlas Weiss with the affix on it. 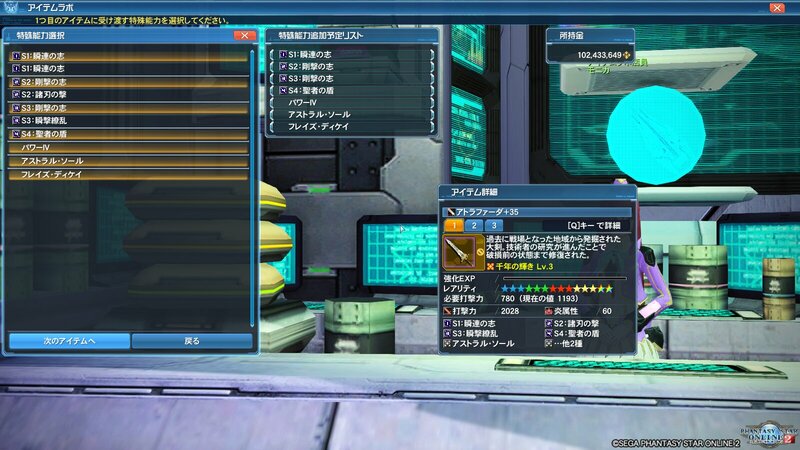 Afterwards, you can continue reaffixing the S4 at 100% as long as you do not remove it from your Weapon. This can be done with any of the Weapon Types. By selecting S級特殊能力の受け渡し (S-Class Special Ability Transfer) at the Item Lab, you’ll be able to swap S-Class Abilities between your weapons. This allows you to create various combinations without disturbing the regular Special Abilities on your weapon. However, there are cases when you might lose your regular abilities, you’ll be warned beforehand if this happens. First, select the weapons to be assigned as [Weapon A] and [Weapon B]. When selecting [Weapon B], it must be a weapon that already has S-Class Abilities affixed onto it. S-Class Abilities onto the weapon than what it originally had, then one or more of your regular abilities will be lost in the process. After completing [Weapon A], you’ll move onto [Weapon B]. The list will now populate with the rest of the S-Class Abilities that weren’t selected in the previous step. If you happen to select fewer S-Class Abilities onto [Weapon B] than it previously had, then its number of affix slots will be reduced accordingly. Once everything is selected, the window next to the confirmation screen will display the list of abilities that will be placed on [Weapon A] and [Weapon B]. The total price for this swap will be determined by the number of affix slots and the number of S-Class Abilities on a single weapon. In the example image, it’ll determine the price based off [Weapon A] since it has the most Affix Slots and S-Class Abilities. 輝充の志 +3% Damage when PP is 40% or above. 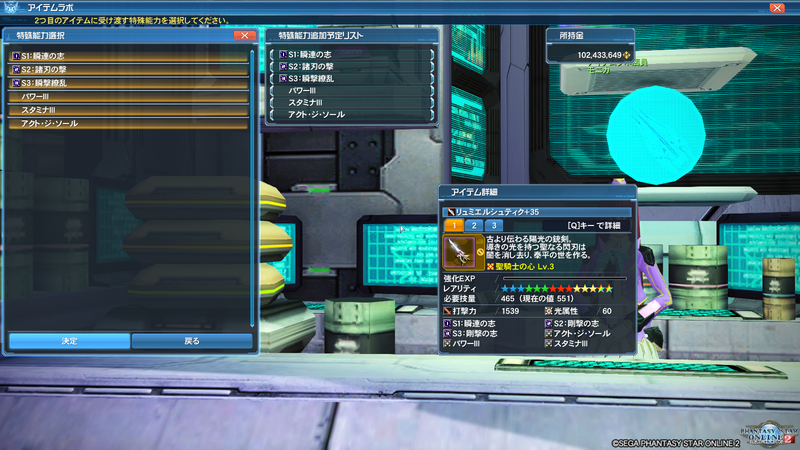 諸刃の撃 +4% Damage, but +8% Damage Taken. Increases damage based on Photon Blast gauge. 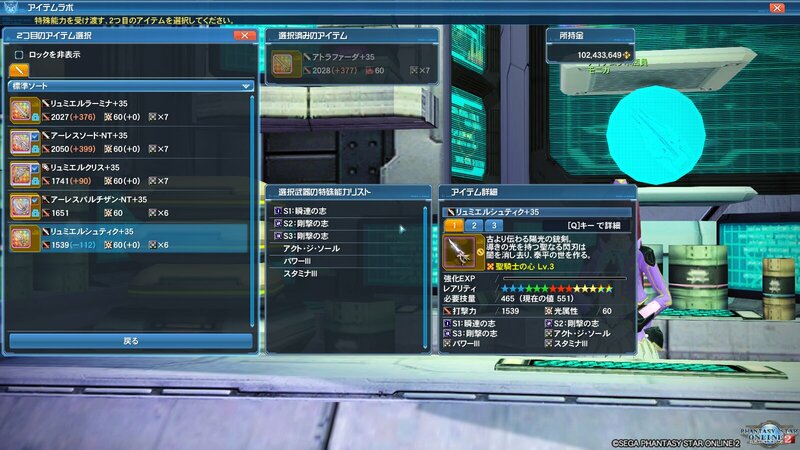 打撃増幅 +1% Damage for every 60 S-Atk affixed onto your weapon, gain +2% Damage more at 200 S-Atk. 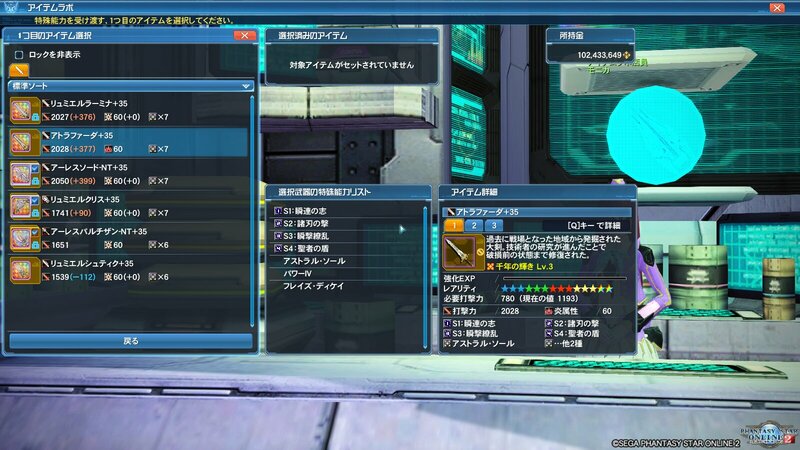 射撃増幅 +1% Damage for every 60 R-Atk affixed onto your weapon, gain +2% Damage more at 200 R-Atk. 法撃増幅 +1% Damage for every 60 T-Atk affixed onto your weapon, gain +2% Damage more at 200 T-Atk. +4% Damage, but take 5% of your Max HP as damage every 20 seconds. 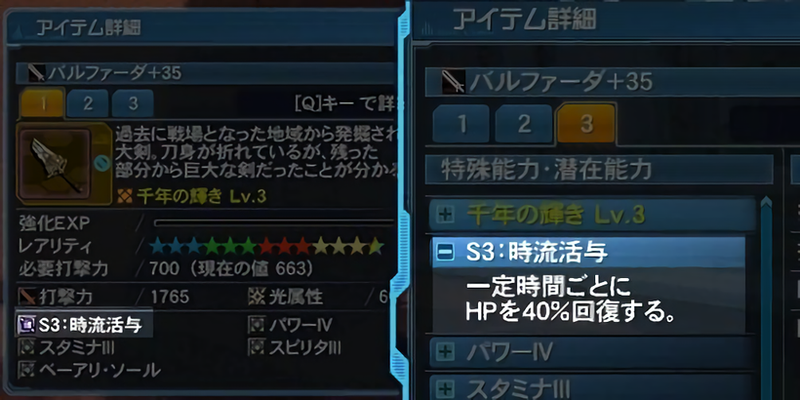 気輝応変 PP recovery speed changes when the weapon is sheathed / unsheathed. 25% chance to inflict enemies with Jellen on Attack. +3% Damage for 30 seconds after inflicting 450,000 damage. 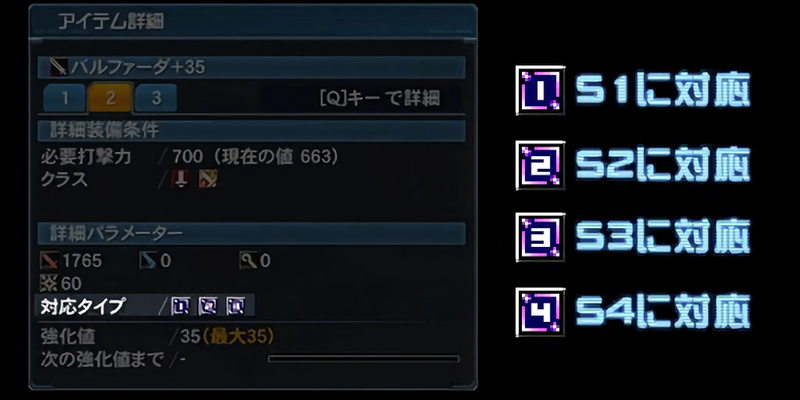 海ノ青閃 Recover 4% HP every second for 30 seconds after taking 600 damage. The barrier reduces damage by 8% and prevents flinching. 8% PP Consumption Reduction for 20 seconds upon Just Guarding. +20% PP Recovery on attacks for 30 seconds after using 150 PP. 影ノ黒閃 Increase Natural PP Recovery for 20 seconds after standing still for 5 seconds. 瞬撃繚乱 +3% Damage when Just Attacking different PAs/Technics. 諸刃の撃 +3% Damage, but +6% Damage Taken. +3% Damage when the enemy’s Element Weakness is Fire. Increase Burn and Fire Resistance. +3% Damage when the enemy’s Element Weakness is Ice. Increase Freeze Resistance. Reduces damage taken based on Photon Blast gauge. 災転輝与 Recovers PP by 15% when receiving damage. 時流の恵 Recover 10PP every 4 seconds. 12% PP Consumption Reduction when Just Attacking different PAs/Technics. Increases Natural PP Recovery Rate based on Photon Blast gauge. Increases PP Recovery on attacks based on Photon Blast gauge. After a PA / Technic hits, PP Consumption is reduced for 30 seconds. Sometimes may greatly reduce PP Consumption. [S1:White Snow Flash] are active. [S1:Blue Ocean Flash], or [S1:White Snow Flash] are active. [S1:Green Leaf Flash], or [S1:Black Shadow Flash] are active. 猛威の奮激 Increases Damage and PP Recovery. Reduces PP Consumption. Effect disappears upon taking damage. 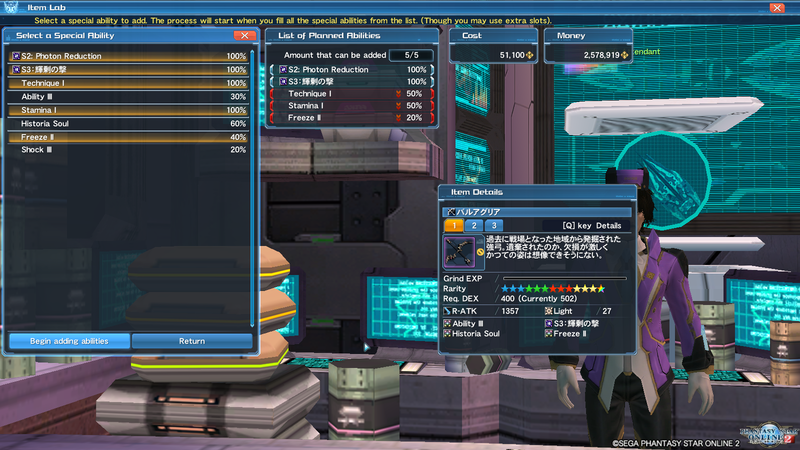 +3% Damage when Just Attacking different PAs/Technics. PP Consumption Reduction based on Photon Blast gauge. Recover 7PP every 4 seconds. [S1:Black Shadow Flash] are active. Generate a damage reducing barrier at set intervals. While guarding, PP naturally recovers and PP recovery speed increases. 六色の輝秤 Decrease Natural PP Regen and PP Consumption when [S1:Red Petal Flash], [S1:Blue Ocean Flash], [S1:Yellow Moon Flash], [S1:Green Leaf Flash], [S1:White Snow Flash], or [S1:Black Shadow Flash] are active. The Photon Flare is a Class skill of FO right?